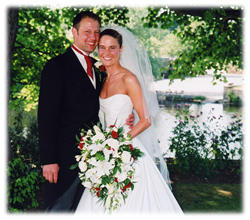 In addition to photography (see separate pages), I can also offer video coverage of your wedding. This is done using the latest high end video equipment to produce a DVD containing footage of your day. The style of filming is usually informal and I try to be as unobtrusive as possible, to leave you to enjoy your day without being overly conscious of there being a camera present. Videos can be produced in widescreen (16:9) or traditional (4:3) formats using professional quality equipment. Editing can allow a variety of effects, cutting out (or including as an out-take!) any embarassing slip-ups, incorporating slide-shows of "growing up" photographs or your guests' photographs from the day; the possibilities are ever expanding. Coverage of the wedding day only; ceremony and reception venues up until the line-up or meal begins. 1 edited DVD. 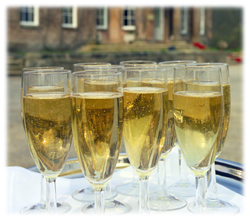 Coverage of the rehearsal, wedding ceremony and reception, speeches, first dance and evening reception up until 10pm. 3 edited DVDs including �out-takes�. Coverage of the rehearsal and full day, from bride�s leaving address, wedding ceremony, wedding breakfast and evening reception up until 11pm plus slideshow of photographs and �out-takes� (if requested) on 4 edited DVDs. Gold with Marryoke; star in your own music video! Fancy trying something a bit different? You may well have seen "marryoke" videos featured on the TV or "marryoke" on YouTube. You could be the star of your own music video! You and your guests mime / karaoke to your favourite song and it is edited into a music video. Usually this is filmed as part of your wedding day (please note, it takes quite some time to film), or alternatively parts of this can be filmed on a different day. This combines the gold package (see above) for "usual" wedding filming, plus the additional music video. I work on my own so I'm unable to undertake both video and photography at the same time. However, it IS possbile for me to take breaks from filming during the day to take photographs. So, for instance, if you wanted me to take some photographs after the ceremony and then again later at the reception venue, this is possible for £150. These can then be incorporated into the above video packages as a slideshow on the DVD, or alternatively you can have them on a seperate disk or in an album. For the album costs, please refer to my photographic packages under the cost of a second / parents' album. The couple can choose their own selection of music to accompany the edited film (subject to copyright), or else leave the choice to me. Please supply CDs or MP3 format files containing the chosen music. 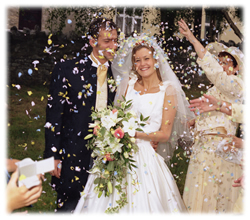 Depending on which package you choose, I can cover the rehearsal, from the leaving address, ceremony, reception and right up to the evening reception and dancing. In every package I usually take a good selection of informal / candid footage as well as the traditional formal style images. If you wish the proportion of these to be increased, please let me know. A selection of �early years� and other photos can be added to the DVD as a slideshow, if you wish. If you have a stills photographer at your wedding, with their permission you can also have a slideshow of those photos added. Please discuss with me for the technicalities of what type of photographs can be added. I can arrange a 7 inch digital �photo� frame that can sit on your mantelshelf or coffee table and play a lower resolution version of your main film, as well as include a slideshow of the still photographs your photographer has taken. �150. Your DVD(s) will contain edited footage showing the day as I interpret it. Usually it will be in 16:9 widescreen format for PAL televisions, but can also be produced in 4:3 format if you prefer (please inform me ahead of the day after speaking to whoever might require copies). A 25% deposit is payable upon completion of the booking forms. The balance is paid upon delivery of the video after the wedding. All footage taken by me remains my copyright. The couple must speak to the venues to ensure they are aware I shall be attending, and pay any copyright fees required by the venues (eg. Church copyright fees). Where the couple request particular music to be incorporated within the DVD, copyright fees must be paid to the Performing Rights Society. VAT is included in all the above prices at the prevailing rate. Should the rate of VAT change, prices will vary accordingly.